We’d love your help. 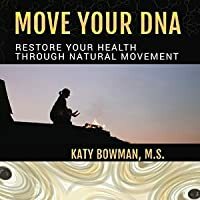 Let us know what’s wrong with this preview of Move Your DNA Restore Your Health Through Natural Movement by Katy Bowman. 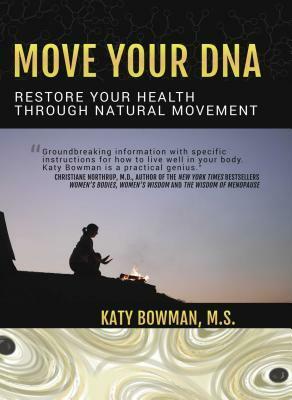 To ask other readers questions about Move Your DNA Restore Your Health Through Natural Movement, please sign up. Is there much cussing or distasteful stuff in this book? Thanks in advance. It saves the trouble of returning books. Gavin Morgan On the contrary, Bowman is a notably eloquent, and maturely articulate writer. I am a huge fan of Katy Bowman. Her holistic yet thoroughly scientific approach to health and wellness is extremely fascinating and incredibly effective. I have experienced first hand how releasing tensions and correcting alignments can fix seemingly unrelated health issues--and thus believe her when she says that the majority of chronic ailments our society suffers, have mechanical components that are largely unaddressed. The first part of the book is fairly technical discussing adaptions of th I am a huge fan of Katy Bowman. Her holistic yet thoroughly scientific approach to health and wellness is extremely fascinating and incredibly effective. I have experienced first hand how releasing tensions and correcting alignments can fix seemingly unrelated health issues--and thus believe her when she says that the majority of chronic ailments our society suffers, have mechanical components that are largely unaddressed. The first part of the book is fairly technical discussing adaptions of the muscles and cells at microscopic levels. While it may be a bit much for some people I love the technical details and kind of wished for even more. The middle part of the book mostly describes how our modern environment causes our body to adapt into adopting damaging chronic positioning that cause us to restrict our ranges of motion. For instance don't sit on your tail bone, stand with your feet straight instead of pointing out, drop your ribs, ramp you head back over your shoulders instead of jutting it forward, straighten your legs instead of keeping your knees bent. She also points out the irony in that even those who are diligent exercisers are usually still sedentary for the majority of the time, and that the exercises most of us do for health are just more inputs that cause us to adapt to restricted ranges of motion instead of ones that promote greater ranges of motion and thus why many extremely fit people suffer from poor overall health. She also discusses the psychology of how if you are participating in movement as part of you daily life versus as a compartmentalized chore or activity, the greater an impact it will have on your overall health. Then in addition to adjusting your daily habits of sitting, standing, walking, etc she does offer some corrective exercises that can be done to help us mimic some natural motions we often miss in our modern lives. While the descriptions are thorough and contain pictures and also excellent notes on how our body can try to "cheat" to avoid the desired effect, I recommend watching her free youtube videos or downloading some of the $5 classes she offers, as videos are a better media for explaining exercises clearly. I'm a great fan of Katy Bowman's and read everything she's written that I can get my hands on. I wanted and expected to give this book 5 stars, but I had two problems with it: I couldn't understand from her written instructions how to perform many of the exercises in the book (perhaps more pictures or links to videos would have helped me), and that at the end of the book, I was more confused than when I started. I had a specific question and not only wasn't it answered, but I felt I was given co I'm a great fan of Katy Bowman's and read everything she's written that I can get my hands on. I wanted and expected to give this book 5 stars, but I had two problems with it: I couldn't understand from her written instructions how to perform many of the exercises in the book (perhaps more pictures or links to videos would have helped me), and that at the end of the book, I was more confused than when I started. I had a specific question and not only wasn't it answered, but I felt I was given conflicting indications on how it would have been answered. I guess I will have to write her an email and hope that it will not drown in her inbox and that she will choose to dedicate some time to answer it. (If I succeed, I will of course add a star). No thanks, I'll sleep on my comfy bed rather than curled up on some tree roots in my backyard. I'm pretty into wearing shoes too. Clear out the nightstand, cos this is my new bible. Katy Bowman proposes that we need to think of movement the same way we think of food. Our "movement diet" needs to be natural and varied, and it isn't optional. The first half of the book explains basic biomechanics and cell function, relating to a " Clear out the nightstand, cos this is my new bible. The first half of the book explains basic biomechanics and cell function, relating to a "movement environment." The biggest idea is that we aren't moving anywhere near enough, or properly. All exercise as we do it is movement, but not all movement is exercise. My favorite theme was that the way we live our lives today is like animals in captivity. Bowman likens out knee/back/mobility problems to captive orcas fins flopping. We are experiencing, "diseases of captivity." Cool huh. Now I studied kinesiology in college. I'm not sure if I would have struggled with some of the concepts if I didn't have that background, but I don't think so. Everything is explained quite clearly. Now that you're all terrified because you're ruining your body, the second half of the book is a practical guide to fixing bad habits. Bowman gives us specific movements and releases to start regaining mobility and strength. Mostly though, it's just a matter of changing your daily habits to incorporate more natural movement. The exercises given are good. A handful of them are difficult to understand in the book, but these I just looked up on YouTube and found loads more information. This is a great book to read, if you want get a basic understanding of what ”natural movement” means. It turns out, sitting is not really the new smoking, and standing is not the cure for everything. Varied and diverse movement is the key, so try to sit and stand in as many ways as possible. The book has giving me a great desire to get my own garden, as doing garden work must be one of the truest expressions of natural movement. this book calls for a shift in the paradigm that associates all body movement with exercise. I enjoyed it immensely and have already been putting into practice the various, subtle, easy and common sense movements into my day. I particularly related to the idea that our modern day, sedentary bodies are similar to orcas in captivity. we are designed and capable of much more than sitting in front of tvs, phones, and computers. Katy's thoughts on natural movement really resonated with me and isn't something that I've seen a lot before. The book had great detail and easy exercises, but it was hard to remember everything listening to it on my commute. I'll be listening again and trying the techniques. Comprehensive, motivational overview of natural movement as a lifestyle (along with a slew of carefully explained corrective exercises). I am very inspired and plan to keep devouring everything Katy Bowman has written. This book is about the concept of natural movement and practical ways to use this science to improve our health. Bowman explains that the biomechanics of the way we habitually move puts certain "loads" on our bodies on a cellular level, and these loads have far-reaching consequences to our health. This concept is brand new to me - or at least until I read this book I did not pay a lot of attention to natural movement, natural footwear, or anything paleo. The natural movement "movement" is relate This book is about the concept of natural movement and practical ways to use this science to improve our health. Bowman explains that the biomechanics of the way we habitually move puts certain "loads" on our bodies on a cellular level, and these loads have far-reaching consequences to our health. This concept is brand new to me - or at least until I read this book I did not pay a lot of attention to natural movement, natural footwear, or anything paleo. The natural movement "movement" is related to the paleo diet in the sense that both encourages getting back to our natural cave-dwelling roots. I found the information presented in this book fascinating on several levels. Even though it has only two days since I started reading the book some of the simple technique Bowman recommends are already helping my foot pain and muscular-skeletal issues. The proof is the pudding and the movement adjustments she describes are very easy to incorporate in your daily schedule. Also there's a philosophical dimension in whole idea that the way our "paleo" ancestors were is the way we're "supposed" to be. Modernity with all its conveniences – pillows and mattresses, soft chairs, flat floors, computers, grocery stores,indoor living, and shoes and some of its inconveniences: i.e., constant noise – is affecting our health and changing our bodies in ways we do not even realize. The way we have set up our environment means that some of our cells literally never move or experience a "load", which has a health effect similar to never getting a needed vitamin. Our bodies "evolve" to adjust to the changes in our environment, but more often than not the adjustment is detrimental to our health. For example, when we do lots of reading and computer work, and do not spend enough time looking at distant horizons, naturally causes our eyes to adjust to the circumstances by becoming nearsighted. The solution as presented in this book is to move our bodies in the way they used to move when are species lived closer to nature. The idea sort of implies that our bodies are "designed" to operate in a certain way and when we operate closer to the design we feel and function better. "Despite our great fortune to live in a time when we aren't at great risk for communicable diseases, we are, in fact, dying - slowly, in bits - from our natural tendency to do as little as possible. Our unquenchable desire to be comfortable has debilitated us. Ironic, as there is nothing comfortable about being debilitated. The paradox - that advancements to make our lives less physically taxing have taxed us physically - is profound and has led to an emergent scientific hypothesis. Perhaps the "Despite our great fortune to live in a time when we aren't at great risk for communicable diseases, we are, in fact, dying - slowly, in bits - from our natural tendency to do as little as possible. Our unquenchable desire to be comfortable has debilitated us. Ironic, as there is nothing comfortable about being debilitated. The paradox - that advancements to make our lives less physically taxing have taxed us physically - is profound and has led to an emergent scientific hypothesis. Perhaps the only way out of our poor physical state, created by our culture of convenience, is a return to the behaviour of our ancestors." I read a brief excerpt from this book which had me worried it was going to be a very technical read but was pleasantly surprised by its conversational tone. Very readable. The more detailed bits are either in sidebars or are woven nicely into the text. This book had some missing pieces for me regarding positioning and outlook when it comes to mobility. Exercise is only a very small part of movement; it's what you're doing all the time you need to keep in mind. That said, the book does contain exer I read a brief excerpt from this book which had me worried it was going to be a very technical read but was pleasantly surprised by its conversational tone. Very readable. The more detailed bits are either in sidebars or are woven nicely into the text. That said, the book does contain exercises to help get your body back to its natural state (i.e. not sitting most of the day for one). I like the calf stretch on page 97. I'll be trying out more of them while incorporating more movement throughout the day. Some really interesting ideas about nutritious movement and about how we hurt our bodies by repeating the same movements over and over. Our current day life skews our gait and the way we move and we are not moving naturally. I think I'd have to read this a couple of times to get everything out of it. I've never read anything quite like it. She has DVDs and I think I'll be checking them out of the library. Some really fascinating and new ideas about how to live well in your body and how to move. The loads we experience in today’s world differ hugely from the loads people experienced a hundred, a thousand, and ten thousand years ago. Yet we blithely accept that our health issues—which so many of us share—are genetic. Genetic, a term we’ve internally defined as beyond our control. Whether out of convenience or ignorance, we have failed to address the habitat in which our genes dwell, and the impact of the way we move on the state of our health. Wow. Move Your DNA provided a completely new way of thinking more than anything else I've outside of The Elegant Universe. Bowman teaches that a variety of everyday movements done properly is better than a traditional exercise regimen. This was a good first exposure to the Movement movement, but the instructions for techniques I think will be easier to grasp if I can see them, which is why I plan on ordering a couple of Bowman's videos. Katy Bowman has a gift for doing two things: breaking down the intricate world of human biomechanics into pieces that the last person can understand (and move forward with if desired), and making the process a hell of a lot of fun. She totally changes the paradigm of proper movement away from "exercise" and thrusts it into a world of necessity, health, longevity, and more. I recommend this book to everyone! This is a paradigm-shifter of a book. I read it, was highly resistant to the message, backed off, listened to a few of the KatySays podcasts, came back, read it again, and felt like a wall fell. Read it. Now. Then read her other books. Then circle back again. Rumor has it her upcoming book shifts the natural movement paradigm even further, and I can't wait. Just listened to the author speak with Joe Rogan for 3 hours on his podcast. Loved listening to this woman. She knows her stuff and how to share. This book is going to be my nearly-constant companion for some time to come. Changed my way of thinking about exercise and movement. Excellent book on the importance of movement and how to regain more natural movement in your own body. This book is for all humans! Especially zoo humans! Excellent! For those familiar with evolutionary mismatch theory (in a nutshell: our modern environment (ie. processed food, artificial light, etc.) is mismatched with our more slowly evolving biology), Katy Bowman's application of mismatch to the area of movement is a totally obvious extension of this way of thinking. Except I NEVER would have thought of it without her help. This book epitomizes my "aha!" moment for the year of 2018 (so far, who knows what might happen...). Katy Bowman advises us to move m For those familiar with evolutionary mismatch theory (in a nutshell: our modern environment (ie. processed food, artificial light, etc.) is mismatched with our more slowly evolving biology), Katy Bowman's application of mismatch to the area of movement is a totally obvious extension of this way of thinking. Except I NEVER would have thought of it without her help. This book epitomizes my "aha!" moment for the year of 2018 (so far, who knows what might happen...). Katy Bowman advises us to move more, and move more of us. This book unpacks what she means by that in a very readable mix of theory and practical instruction. She explains how making small adjustments to the loading of your body (think footwear, gait, sitting), and how focusing less on bouts of exercise and more on all day, whole body movement can make a big impact in your overall health. And if this sounds not very revolutionary, that's because it's hard to convey big, paradigm-shifting ideas in a short review! Try thinking of yourself as an animal that has just found out it's in a zoo. That your exercise routines (whether you are a devout gym user or a casual neighbourhood walker) are but a poor shadow of the movement for which your body is intended, like a cheetah pacing laps around a small familiar enclosure. Boom! Mismatch. "Illness is typically looked at as physiology gone wrong. I assert here that in most cases, our physiology is responding exactly as it should to the types of movement we have been inputting. Instead of thinking of ourselves as broken, we should recognize our lack of health as a sign of a broken (mechanical) environment." "Movement is not as optional as we have led ourselves to believe. Just as a lack of food (or, heaven forbid, oxygen) leads to a multitude of biological signals and physiological outcomes, people are living in their body-houses surrounded by screaming alarms in the form of pain, illness, and disease, and they are unaware of the source of the problem. You have been doing the movement equivalent of under-eating and under-breathing, which is having an impact on your whole body, right down to the cellular level." I'm a big fan of Katy's podcast so I knew this book would be good. She delivers the meaty information here with humor and skill; the lady knows her stuff. The only thing that keeps it from 5-stars is that the gold standard of health and wellness seems to rest on the hairy shoulders of the Paleolithic man. Like the paleo and primal diet movements, Katy holds the daily physical activities of this early human as the model we should be striving for. I get the concept: our lives (and our diets and mov I'm a big fan of Katy's podcast so I knew this book would be good. She delivers the meaty information here with humor and skill; the lady knows her stuff. The only thing that keeps it from 5-stars is that the gold standard of health and wellness seems to rest on the hairy shoulders of the Paleolithic man. Like the paleo and primal diet movements, Katy holds the daily physical activities of this early human as the model we should be striving for. I get the concept: our lives (and our diets and movements) are far, far removed from our ancestors who hunted and gathered, and that is not a good thing. We have chairs and beds, wear shoes and undergarments, and can usually find everything we need within a small radius of where we dwell. But why is the Paleo model better than, say, the Native American way of life? Why the sentiment that any kind of physical evolution has been a bad thing? This is an excellent book about how to improve your health. It takes the idea of movement and turns it on its proverbial head. The author isn't seeking just any movement, though in todays world, anything is better than sitting. But movement that will affect you at the cellular level. It is a very interesting concept. She takes the communication channel that we usually think is outward (from the cell to how the whole body feels) and reverses it. By performing specific movement exercises, the movem This is an excellent book about how to improve your health. It takes the idea of movement and turns it on its proverbial head. The author isn't seeking just any movement, though in todays world, anything is better than sitting. But movement that will affect you at the cellular level. It is a very interesting concept. She takes the communication channel that we usually think is outward (from the cell to how the whole body feels) and reverses it. By performing specific movement exercises, the movement communicates with the cells, helping them remain healthy. A bit of epigenetics seems woven in. I have spent move of the year working the movements into my daily routine. I have some that I really like, such as the balls on the bottom of the feet while standing. I do this while typing at my standing desk. It feels great and my hands don’t give me as many problems. I found the author when I was searching for barefoot walking advocates in the state of Oregon. There are not many, but she is one. I am a practitioner of barefoot walking, having changed my gaite and step many years ago. It solved a number of problems I was having with my feet and knees. I will be following more of her work and keep working to incorporate the movements into my day. Katy Bowman is wise and witty. She has an ability to explain complex ideas in an easy-to-digest manner for everyone. This book does not teach movement professionals or movement-professionals-to-be (myself) new things within the realm of *status quo* body knowledge. What it does do is hop outside of the mainstream thought patterns that have permeated domains such as physical therapy and encourage us to broaden our perspective. This book is a call to wellness. It's a call to lifestyle change, and Katy Bowman is wise and witty. She has an ability to explain complex ideas in an easy-to-digest manner for everyone. This book does not teach movement professionals or movement-professionals-to-be (myself) new things within the realm of *status quo* body knowledge. What it does do is hop outside of the mainstream thought patterns that have permeated domains such as physical therapy and encourage us to broaden our perspective. This book is a call to wellness. It's a call to lifestyle change, and it does so through addressing areas of our life that aren't often talked about in our diet and exercise obsessed world. How are you sitting/standing/lying? What number of different positions do you occupy in a twenty-four hour span? What is your movement vs. exercise relationship like? Loooooove Katy Bownman. I wish I could have everyone read this but I understand most people don't nerd out on biomechanics and anatomy... or they don't like this hippie tree-hugging, barefoot walking stuff. Some will, once they already have chronic back, knee, and foot pain and they have the joint mobility of a stick. It's unfortunate, but hopefully as moving more (as opposed to exercising more) becomes more culturally accepted, people won't have to get to that point. This book goes into some ni Loooooove Katy Bownman. I wish I could have everyone read this but I understand most people don't nerd out on biomechanics and anatomy... or they don't like this hippie tree-hugging, barefoot walking stuff. Some will, once they already have chronic back, knee, and foot pain and they have the joint mobility of a stick. It's unfortunate, but hopefully as moving more (as opposed to exercising more) becomes more culturally accepted, people won't have to get to that point. Katy Bowman has earned an international reputation for educating the general population on alignment and load-science, and as a result has helped thousands to reduce pain, increase bone density, improve metabolic health, and solve their pelvic floor mysteries. She is known for her radical, counter-culture health directives that happen to be based in the hard science that she has made her life’s wo Katy Bowman has earned an international reputation for educating the general population on alignment and load-science, and as a result has helped thousands to reduce pain, increase bone density, improve metabolic health, and solve their pelvic floor mysteries. She is known for her radical, counter-culture health directives that happen to be based in the hard science that she has made her life’s work. A biomechanist by training and a problem-solver at heart, Katy’s ability to blend a scientific approach with straight talk about sensible solutions and an unwavering sense of humor have earned her legions of followers. Her blog, KatySays.com, reaches hundreds of thousands of people every month, and thousands have taken her live classes. She regularly writes for and is featured as a health expert in publications such as Prevention, IDEA, and Self, and is a funny and entertaining guest on radio and television talk shows and news segments. Katy is the founder and director of the Restorative Exercise Institute, which teaches the biomechanical model of preventative medicine to health professionals and laypeople worldwide, both online and in live seminars. She is also the creator of the popular Aligned and Well DVD series, a step-by-step visual guide to learning the basics of skeletal and body alignment. Katy’s groundbreaking work in pelvic floor restoration has made her particularly popular with midwives, OBGYNs, and others concerned with pelvic mobility, strength, and health. Her books Every Woman’s Guide to Foot Pain Relief: The New Science of Healthy Feet (2011), and Alignment Matters (2013), have been critically acclaimed and translated worldwide. In between her book writing efforts, Katy travels the globe to teach the Restorative Exercise Institute’s courses in person, getting the world moving one calf stretch at a time.